This hike goes up a beautiful drainage, then follows an amazing ridgeline giving you unparalleled views of the Gallatin Range, with a few bonus petrified trees to round out an epic loop. The Dailey Creek Trail starts its way across broad, grassy meadows bordered by forest as it follows Dailey Creek upstream. These meadows feature big views all around. The trail occasionally passes through small sections of trees. The distressed mountains on which the Sky Rim Trail runs, loom in front of you. As the trail reaches the head of the drainage, it begins to climb, predominately through trees, up to the ridgeline. Take a right at the junction with the Sky Rim Trail that runs along the ridgeline. This is also the boundary of Yellowstone. Unlike many trails that traverse a ridge, the Sky Rim Trail stays true to the top of the ridgeline. While this maximizes views, which are plenty, it also maximizes elevation by going up and down almost every point along the ridge. Distressed rock formations along the ridge contain petrified trees both lying down and standing up. Outside of the park to the north, Specimen Ridge contains many petrified trees along its length as well. Some sections of the trail are along rocky ridges, while others are broad and grassy. Following the ridgeline takes you to the high point of the trail at Big Horn Peak. Bighorn sheep frequent the area and mountain goats can often be seen on the cliffs of the north face of the peak. The Sky Rim Trail continues on towards Shelf Lake and drops into the Specimen Creek drainage. (See Specimen Creek for description.) 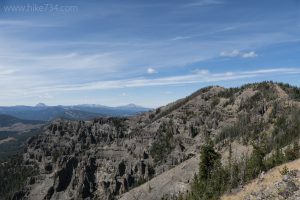 To do the loop, however, drop into the Black Butte drainage from Big Horn Peak. The trail into the Black Butte drainage isn’t immediately apparent, but head down the grassy slope, following a few of signs, for a couple hundred yards. Stay a bit to the left and the trail will appear. The trail enters the trees where it spends most of its time. As you work your way down, the forest changes depending upon the elevation and aspect of the slope. Keep an eye on King Butte to the northwest as it has a few large, brown, petrified trees on its gnarly dark-gray face. As you work your way lower, the area opens up to more meadows, and the trail eventually joins up with Black Butte Creek at the bottom of the drainage. After following the drainage for a bit through a nice mixture of forest and meadows, a junction for the Dailey Creek Cutoff Trail takes off to the right. Follow the cutoff trail up a meadow and over the ridge. Along the way, you will pass a patrol cabin before working back down towards Dailey Creek. The trail joins back up with the Dailey Creek Trail, and will take you back to you car. 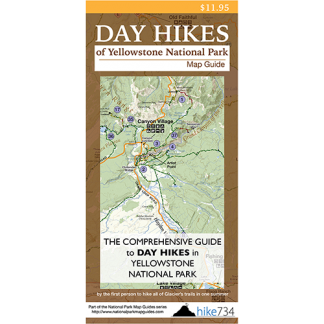 Trailhead: Located halfway between Big Sky and West Yellowstone on Highway 191, the trailhead, signed “Daly Cr.” is on the east side of the road.